Arrange your round-trip airport transfer from Lihue International Airport (LIH) in advance and skip the hassle of booking a service in Kauai. 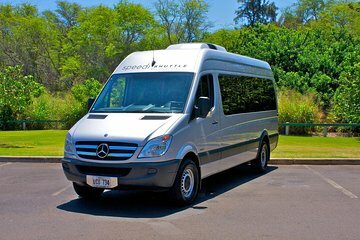 This convenient Lihue airport shuttle takes you from Lihue Airport to your hotel or private residence in Princeville, Kahala, Poipu, Kapaa or Lihue, and then back again. It means you spend more time enjoying your trip and less time puzzling out the logistics. Please note: You MUST select a hotel that matches the area in the Itinerary section of this product. Geben Sie bei der Buchung Ihre Daten ein, und der Shuttletransfer zum Flughafen Lihue wird automatisch bestätigt. Wenn Sie landen, fahren Sie an den Taxilinien vorbei, zeigen Sie dem Fahrer Ihren Bestätigungsbeleg und steigen Sie an Bord Ihres Kuai Airport Shuttle. Der Service deckt Adressen in Princeville, Kahala, Poipu, Kapaa und Lihue ab, die im Abschnitt Reiseverlauf unten aufgeführt sind. Entscheiden Sie sich für den traditionellen Lei-Gruß, um Ihre Ankunft im hawaiianischen Stil zu machen. Für Ihre Rückreise erwartet Sie Ihr Transport zur vereinbarten Zeit. Beenden Sie Ihre Reise mit Leichtigkeit und landen Sie rechtzeitig für Ihren Flug am Flughafen Lihue. Alle Fahrzeuge sind 12-sitzige Mercedes-Vans mit Klimaanlage und bequemen Sitzen. Bitte beachten Sie: Sie MÜSSEN ein Hotel auswählen, das mit dem Bereich in der nachstehenden Reiseroute übereinstimmt. On time pick up and delivery. A great service. Drivers were very courteous and knowledgeable about the Island and were happy to share their own experiences, and advice and where to go and what to see. Nice drivers they weren't informed we were to be at the airport at the appointed time, even though we emailed them. Guess they had other things on the agenda or too busy. Going back after our week on the island they picked us upon time, and we had time to shop and eat before boarding. No tours. Just go there to relax. Upon arrival the driver was waiting for us and he was very courteous and informative on the long drive to our resort. I truly recommend this service. Excellent. Flora was there waiting for me and was very pleasant to travel with. Only concern was that my receipt did not indicate that I was to travel with Speedy Shuttle. This was a great service. I give it 4 Stars.